Hello, and welcome to my first blog. I hope it all works—technically I mean. Why am I writing a blog? What do I hope to get out of it? Well, not fame and fortune definitely! If I was after either of those I wouldn’t have spent my life playing folk songs or telling traditional stories. Within both those aspects of my career I’ve been a minority taste in very minority field of music/storytelling. But it’s what I do. It’s who I am. I’d rather give it all up than ‘go commercial’ and play something just because it’s popular and earns me a few extra quid. My reason for writing this blog is to share some of the things I’ve learned in nearly 40 years as a professional performer. I don’t intend to write learned articles about particular songs or stories, and trace their development over the millennia or anything like that; other people have done that and probably better than I ever could. I’ll aim to put a personal light on it. Why do I like it? Why do I sing or tell it? And, above all, I’d like to share the history of my relationship with that particular song or story. There are a lot of personal anecdotes and memories attached to most of them—some funny, some serious. So it will be part reminiscence and autobiography as well. I thought long and hard about what to do for the first one and kept on changing my mind—and then decided on this: the difficulty of combining more than one art form. I’ll get to the title later. I started singing folk songs and going to folk clubs whilst at college back in the late 60s and did it as a hobby for some years. (I’d been playing in rock bands, or ‘beat groups’ as we called them then, whilst I was at school.) I made the decision to ‘go professional’ in 1978 and by then I had a repertoire of mainly traditional songs. In the early 1980s I came across storytelling, almost by accident. The first storyteller I heard was Hugh Lupton and it struck me that his stories were just like my songs, minus the tunes. I wondered whether I could do it and learned a few stories to use in schools (I was doing quite a bit of schools work at the time.) That worked and so I tried them in folk clubs as well and, as long as I chose the right story and the right time, that worked too. I’ve been doing the two in tandem ever since so much so that I pinched a description someone used in a review as my strap line—’a storyteller who sings half his stories’. That description works because many of my songs are story songs, including quite a lot of the big Child ballads. Over the years I’ve done the odd shanty and chorus song - you need something to lighten the atmosphere, and I've never shied away from protest songs. I also have some lovely little lyrical songs which just set a scene or describe an atmosphere, but it’s been the stories that I really go for. With that in mind it’s not surprising that I particularly like items which are a song and story combined—a cante fable. It’s not a form which is particularly common in Britain but there are quite a few if you look, although very often the song element has become a rhyme to be chanted rather than a song to be sung. It has been suggested that long ago most storytelling was like this and the audience may have joined in with the song parts. In my repertoire I have several including Orange and Lemon (Appley and Orangey) and Tapping on the Blind. The major one though, is probably Hangman. The song part of it is well known (have a browse on YouTube under that title or Gallows Pole and you'll find dozens of versions by people as diverse as Jean Ritchie, Peter Paul and Mary, Leadbelly, Led Zeppelin and a lot of lesser known, more modern singers). I was doing it as a song for years before I came across a reference that there used to be a story with it—and it needs the story or it leaves you with a list of unanswered questions. I found the story in Joseph Jacobs’ book More English Fairy Tales—The Golden Ball—and put them back together. I don’t do it very often because it’s lo-o-o-ng! I included a much shorter, fragmentary version in my book Derbyshire Folk Tales. Perhaps the best known of all, to the general public, is The Frog at the Well. It was one of the first stories I learned and one which I still do fairly often. 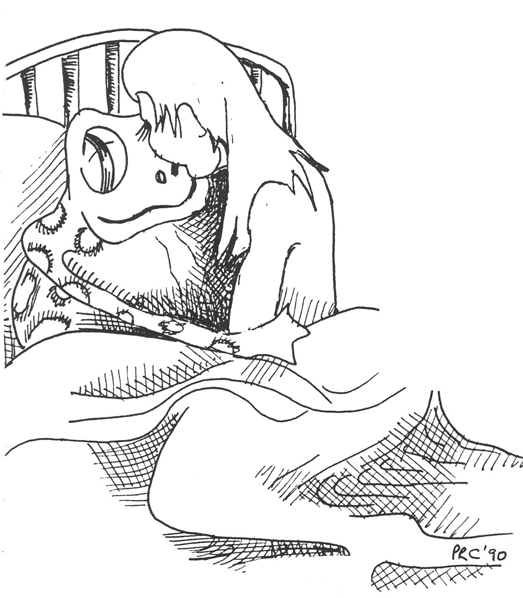 Its basic premise “you have to kiss an awful lot of frogs….” has become a saying. It is also a very important story—far more important than you might imagine. It was partly hearing a Scottish version of it which inspired the Brothers Grimm to start collecting German folk tales! And where would we all be without them? Here is a recording of me telling it from a cassette album I recorded back in 1990 and which has long been sold out. Anyway, at long last, what about the statement I put at the top of this page? Is there a problem with mixing songs and stories? In my mind no. It’s as natural as having cheese with bread or custard with rhubarb. But some people do have a problem. That was actually said to me by the organiser of quite a prestigious folk club. I accepted the terms but found it very inhibiting. Folk club performers have always introduced songs with little jokes or anecdotes, perhaps reminiscences… Every time I started on a song intro I found myself thinking “I hope they don’t think this is a story!” Ridiculous. From the opposite point of view there are also storytelling clubs who don’t think you should include songs. The storytelling revival is much more recent than the folk song revival. For a while it looked as though it might follow the same kind of pattern - small clubs, being based on the tradition, very informal... but it has gradually moved towards theatre and high Art with a capital 'A'. I'm sure I'll write more about that some time in the future. One comment I'd like to give to the folkies who don't like stories is this: I'd bet anything that all the old blokes (and blokesses) from whom songs were collected back in the early years of the 20th century probably also had a repertoire of shaggy dog stories, local legends, tall tales and dirty jokes, but the folk song collectors of the time weren't interested in them, they wanted just folk songs, and not just any folk song, some of them were very choosy about which songs they bothered to write down. If you had a version of Barbara Allen then they wanted it, if it was a bawdy little music hall song or something from a broadside then - not interested. The proviso is that the story you tell in a folk club has to be appropriate, as does the style you use. If everyone is doing a 3 minute song and you launch into a 20 minute tale then you won't be popular, and if you perform it in a style more suited to The Old Vic then that will be just as unacceptable. I think that doing both songs and stories has adversely affected my career - the storytellers have thought of me as a singer and vice versa. Being the editor of Facts & Fiction has been a big plus in some ways but has tended to take the focus off my performing, as did running a radio show back in the 1980s. We love specialists, we don't like Jacks of all Trades or Renaissance Men (not that I'm claiming to be one of those!). How would Leonardo da Vinci have fared today? Would the scientists have ignored him as a mere artist who doodled stupid fantasies and the art establishment ignored his sketches as scientific diagrams?